Description: Biennial herb to 70 cm high; stem with wings cut into spinose lobes. Basal leaves forming a rosette, lanceolate to oblanceolate, 5–25 cm long, 2–10 cm wide, deeply pinnatisect, concolorous, pubescent; cauline leaves similar, shorter, 5–10 cm long, stem-clasping. Heads several; heads hemispherical; involucral bracts lanceolate, outer spine-tipped, slightly spreading, middle spine-tipped, erect, purplish, inner shorter, not spiny. Florets purple. Achenes 4–5 mm long; pappus bristles unequal, 15–20 mm long. Distribution and occurrence: Serious pasture weed, from Glen Innes to the Tumut area. Native of Eur., Asia and N Afr. 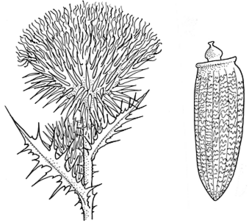 A declared noxious weed throughout N.S.W.